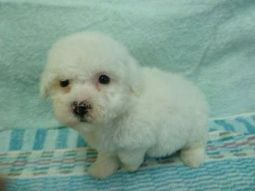 Bichon Frise breeders links and breed information on pups4sale.com.au. Ah, the joie de vivre of the Bichon Frise! Though coming from an unlikely origin, and following an even more unlikely development path, this wonderful little breed has gained tremendous popularity in recent years. 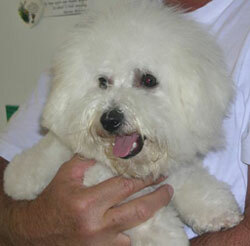 The Bichon Frise can trace its roots back to the Mediterranean in the early 1200s. The Barbet (Water Spaniel) was believed to be the progenitor of the Bichon breed, as well as that of the Poodle and the Maltese. As the years passed and the dogs became more popular, the “Barbichon” family splintered into four distinct breeds… Bichon Maltese, Bichon Bolognese, Bichon Havanese, and the Bichon Tenerife…the last of which, the Tenerife, is where our beloved Bichon Frise comes from. 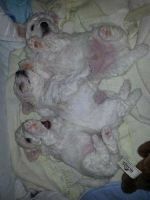 Thanks to Yendale Bichon Frise Kennels for the pictures of Bichon Frise puppies & adults used on this page, and the additional information provided. As trade began in earnest toward the late 1300s, and Italy became a major trade port, the stout little dogs caught the eye of pirates and merchants alike, who then began sailing with, and trading, the popular canines to all ports of call. And, of course, by the 1400s, the elite and nobility of Italy had begun to champion the breed, where it became highly desired. In 1494, France invaded Italy and brought back much of their refined culture to their own country; among the spoils of war was the fluffy, brave, pint-sized Bichon. By 1574, there were Bichon Frise puppies for sale across France, with the breed becoming the unofficial dog of the nation. King Henry III carried his own ridiculously pampered pooch around with him wherever he went. 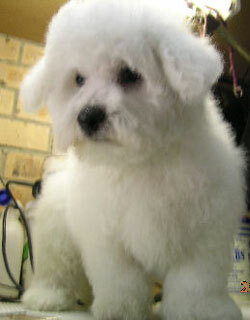 In fact, during that time, the Bichon Frise inspired the French term “bichonner,” meaning to pamper or make beautiful! Believe it or not, the next big wave of Bichon fans came in the 19th century, where the breed was adopted by circus performers and organ grinders to perform tricks, much to the delight of crowds everywhere. Their aptitude and amiable nature was obvious, and their popularity continued to grow. Though the widespread popularity of the breed couldn’t be denied, the breed and bloodlines were fairly unorganized and unregulated. After 1918, controlled breeding programs became systematized, and by 1933, Madam Abadie wrote and enacted the official standard of the breed, then adopted by the Societe Central Canine de France. 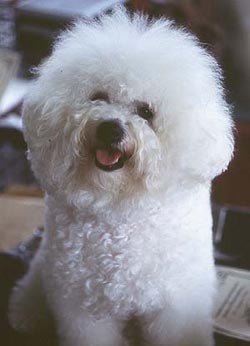 However, at that time, the breed was called both “Tenerife” and “Bichon,” so the President of the International Canine Federation suggested that the dog’s official name be based on outstanding characteristics…therefore the name “Bichon a polio Frise” (or “Bichon with the curly coat”) was approved, and was later shortened to Bichon Frise (meaning “curly lap dog”). The next year, 1934, the Bichon Frise was officially added to the registry of the French Kennel Club. In 1956, the breed was brought to America, where it also began to thrive, and in 1972, the Bichon Frise was officially accepted into the American Kennel Club. 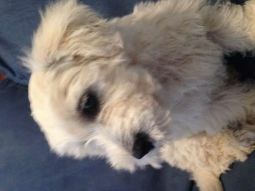 The rest is curly lap dog history, as Bichon Frise breeders will agree! There’s a reason that the breed was able to so easily go from ship to ship and from port to port…and from lap to lap…so quickly: the compact size and hearty nature! The average height is only 9 – 12 inches (males), and 9 - 11 inches (females). Average weight is only 7 - 12 pounds. Of course, you’d never suspect such a slight build thanks to all that fluffy white fur! Contrary to popular belief, white is not the only coat color, though it is typically the show standard. Other colors include cream, buff, or apricot, generally found only around the ears. In the show arena, any variation to coat color that exceeds 10% is penalized. The neck should be gently arched, the forechest pronounced, and the curved tail well “plumed” with longer hair that can wave like a brave little flag in the breeze. And the eyes are always dark, round, soft, and inquisitive. Truly a gaze that can steal your heart! 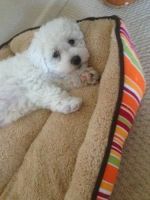 Lively and energetic, the compact Bichon is really up for anything, as long as it can stay close to you and your family! They don’t require a great deal of exercise, but a daily walk and some good play time will keep them both happy and healthy. While the breed is very loving in general, most vets and Bichon Frise breeders would also recommend “pack walks” in addition to other exercise outlets to help curb behavioral problems. A particular problem can be “Small Dog Syndrome,” causing your little Bichon to think they are actually in charge of you. Other issues that may come from lack of play and exercise can manifest in the form of barking, nipping, and separation anxiety. By far, these behaviors are the exceptions to the Bichon Frise, though. A little fetch, a good romp in the park, or a walk around the block should be more than enough to keep your pal behavior-problem free. A merry powerhouse inside a fluffy puff ball, that’s the Bichon Frise. Their gentle and sensitive nature and need for human companionship means that they will be completely eager to please and able to respond well to training (remember, the Bichon wants to make you happy!). They mesh very well with other dogs, pets, and children…so you couldn’t ask for a better family dog. The only problems you may encounter are the “Small Dog Syndrome” mentioned above (which can be avoided with regular exercise and play), as well as housebreaking. 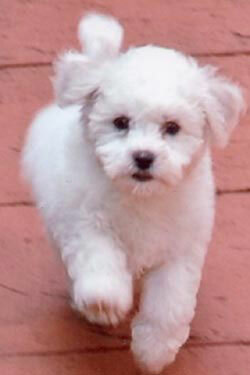 The Bichons are small dogs, after all, and housebreaking small dogs can be challenging (though not impossible). They require a firm hand and reinforcement. Bichons need rules, and they will follow them happily! Amazingly, as of 2004, the UK Kennel Club listed the most frequent cause of death in the Bichon as old age! This breed is relatively healthy, but among the most common ailments are cataracts, skin allergies (especially from flea bites), and ear infections. When more serious illnesses are suffered, those seen can be dislocated kneecaps, epilepsy, and liver shunts. If detected, liver shunts can be corrected and kept in check through diet modification and medication. Look for lethargy, dark urine, refusal of food, and heavy drinking of water. While this condition is fairly rare, it can be fatal if undetected. It’s almost a given that with so much lovely, white, fluffy hair, the breed would be prone to tearing and staining. And, yes, they are. But the good news is that the tearing can be prevented for the most part. The tearing is usually caused by one of several factors: hair in the eye causing irritation, blocked tear ducts, broken or infected teeth, or incorrect diet. There are several good stain removers on the market, but they will not do much good until the main cause of the staining is uncovered. 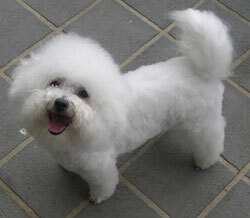 But, by far, the most recognizable feature of the Bichon Frise is their amazing coat. The undercoat is soft and thick, while the outercoat consists of a curlier and coarser fur. The result is a thick, “springy” feel. The beloved fluff-ball appearance is the result of that remarkable double coat being washed and thoroughly brushed. If preparing for a show, trimming is executed so that the fur is rounded above the natural outline of the body, never squared off or overly-short. If your faithful pal is not destined for the show ring, frequent grooming is still recommended (every 4 – 8 weeks or so). A “puppy cut” is easiest to keep up for most Bichon owners. Happy, inquisitive, sociable, hypo-allergenic, compact, loyal and doting companion. This dog has everything a dog owner could want, all in one little fluffy package. They make a perfect family pet, a perfect traveling pet, a perfect every day pet …you just can’t go wrong with this one. If you seek to add the perfect dog to your household, look no further than the Bichon Frise! There are so many reasons the Bichon has gained such solid acclaim for hundreds of years, but if you are lucky enough to love one, you will have all the reason you need…because they will return that love more than you can imagine!